These Bone Appetit Luncheon Plates will come in handy as being scary gives folks a good appetite. 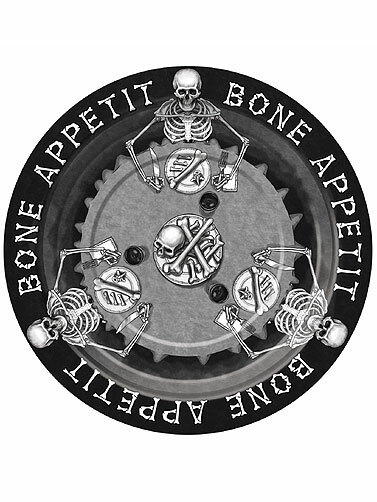 Halloween party guests will love the look of this skeleton themed tableware and the play on the phrase Bon appétit. Black plates with a monochrome print featuring skeletons sitting around a dinner table. Matching Bone Appetit decorations and tableware is available. Each sold separately. Bone Appetit Luncheon Plates measure 9" in diameter. 8 ct.